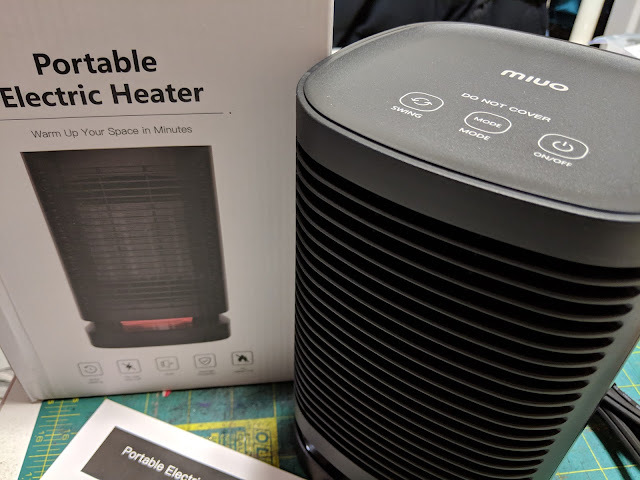 Okay, that was a little click-baity for the title of a review on a space heater - but just today in my city we hit -42℃ with the windchill. My wife's car refuses to start even after being plugged in (yes, I can hear my northern friends chastising us that we should have replaced the battery much sooner). So, outside is pretty chilly, and inside isn't too bad. 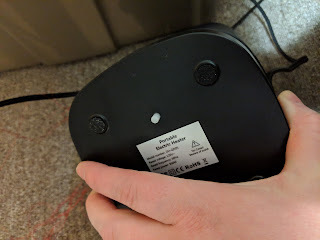 I have a pretty small house and our furnace is pretty darned efficient - yet there are areas of the house that are perfect toe numbing spots. Especially in the basement. Now, in the basement, we have our media centre / fireplace. However, across the area back to where my wife has her sewing corner, it can get a little chilly. A little space heater is a perfect thing to keep her toes warm while she sews me some really cool neckwarmers so I can go and shovel! Okay, so this portable electric heater is available via Amazon for $59.99, however, I have a code here to help you save 37% which brings it well below prices you'll find at your local Canadian Tire. Use code 94LOBMDO and it will bring the price down from $60 to just under $38. Now, you have to use it before February 1, 2019, in order for it to be still valid. It's a simple thing... yet, it does take a moment to look it over. It's 950W, which makes it actually pretty strong actually. My wife had it on a few moments and it was getting pretty warm... which is why there's luckily a low power mode. 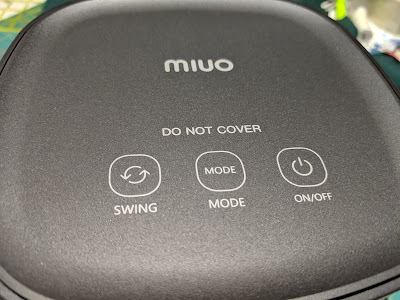 On the top of the device, there are just 3 buttons. 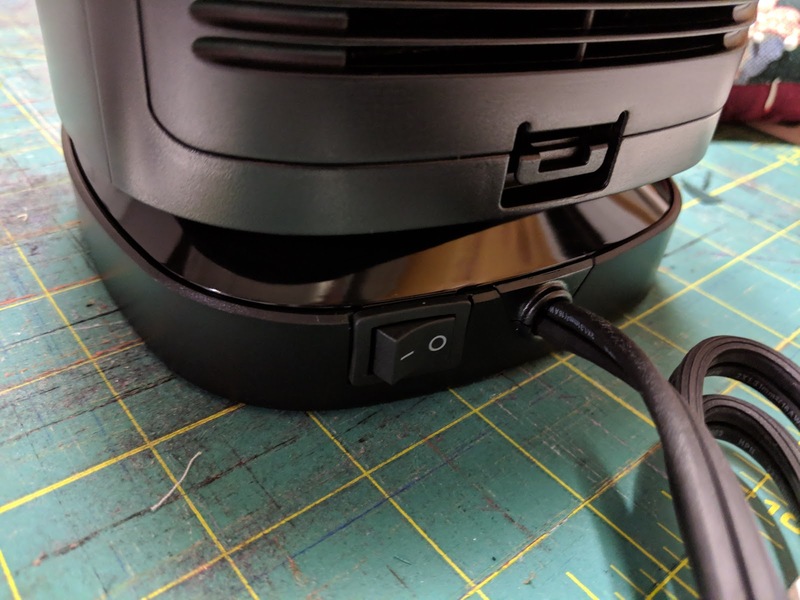 Power is pretty simple to understand (do note that there is a manual power switch on the back. 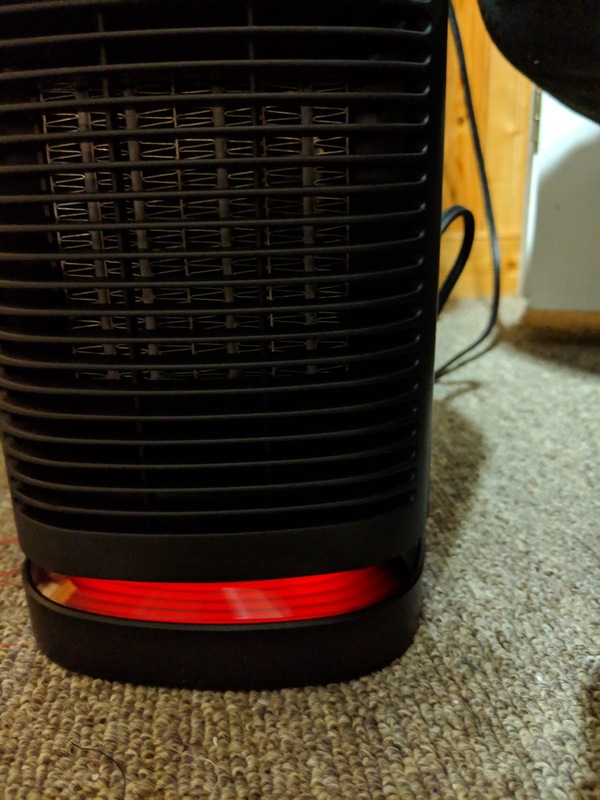 There's a 'swing' button which gets the little space heater to oscillate back and forth (it'll sweep just shy of about 90° ... the manual says 60, but I'm not breaking out my protractor). It's easy to tell which power mode it's on as for the heating mode there's a light that turns RED, and then BLUE for the fan. And you can very easily tell the difference between the high/low with the sound of the fan. Now, I say sound, but it's still pretty quiet. 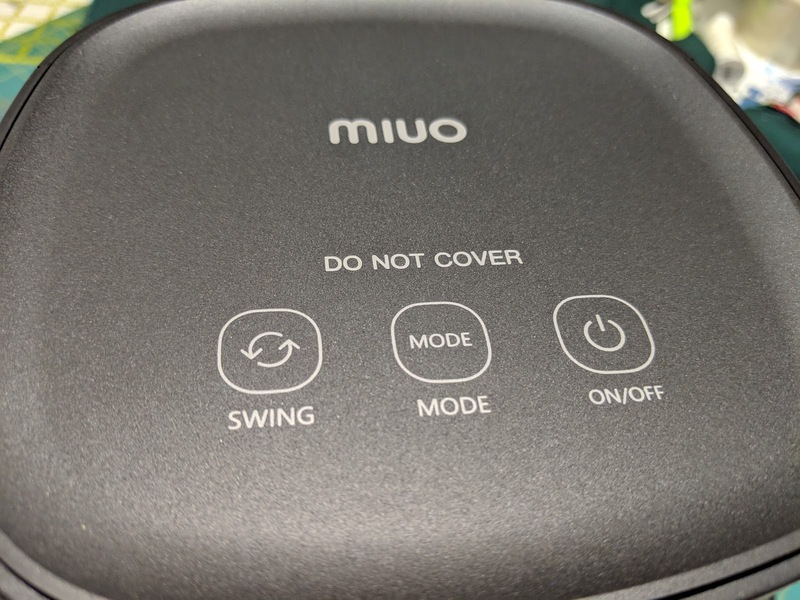 In terms of safety, it has its own thermal cut off (i.e. if it gets TOO hot it'll shut itself off) and, it has a cool 'kill switch'. Afraid that your cat will knock it over, or as you're sewing you accidentally tap it with your toes and that the heat will cause the scrap threads to catch fire? Well, the button on the bottom means that while it's upright, it's pressed, and it can work. 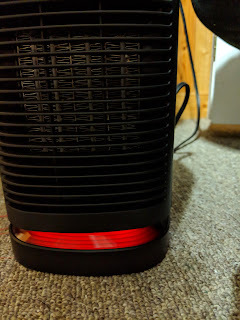 Tilt the heater and the button is no longer pressed and it shuts off. Pretty cool feature to include. Overall, it's a handy little thing. 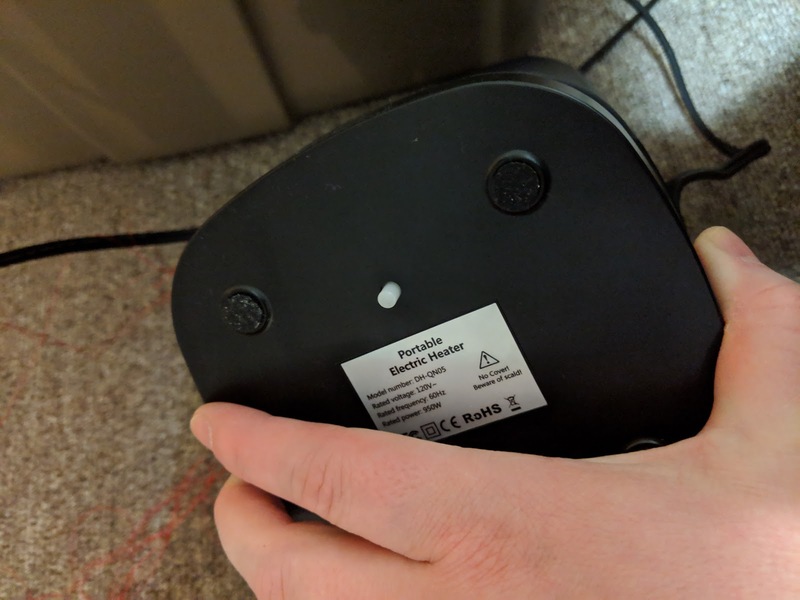 There's a simple little handle on the back to move around. But the best thing is that it simply works. And it works well. Like I said, after a few moments my wife was saying that it was too warm and set it to low. 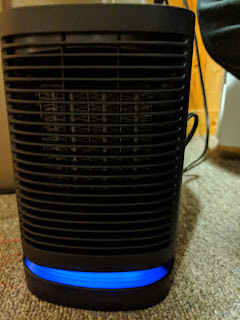 So, sure there are oscillating fans you can get from a local hardware store, but I think it'll be tight to get them to come close to the price with the same amount of features. This says it's 950W and I can't seem to find ratings on models at box stores for similar items. They do suggest that on bigger units (like my fireplace being 1500W) can do 1/10 of the wattage for square footage; so scaling that down this little guy can do about 95sq ft. Which is probably more than enough for most people looking to use it to keep a small area, under a table or something toasty. You're not trying to heat your house (imagine the hydro bill?? ).